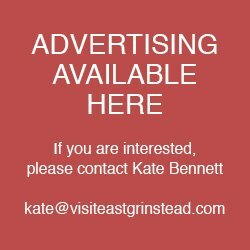 Advertisements on this site should not be taken as endorsement of the advertiser by Visit East Grinstead or any of the partner organisations. All adverts are placed on a random rotation, so your ad could appear first at anytime. There is a maximum of 6 ads per slot. We will warn you within 2 weeks of your adverts time slot running out. We can add special tracking code to your advert so you can manage in your Google Analytics. Ask for more information if you are unclear what this entails. All advertisers are also given a featured listing status within the Directory. If you feel you should be on our listings, please email the address below. If you would like to upgrade and enhance your listing, please download our spec sheet below and send your revised information to the email address on the PDF. If you see your business in the directory and would like to delete your information, please contact the email address below.